The G.M.A. International H.M.C., was established by our club founder & Int'l President Nik "Nefarious" Bloodstörm along with 8 others present, in the shadows of dusk at the infamous Dawson Forest; located in the black Appalachian foot hills of the North Georgia Mountains on a cold, rainy, Autumn evening in September, 2007. We are a consortium of metal and punk rock musicians, fans and life stylers around the world. A unifying collective in the world-wide heavy metal and punk rock community. ✠We have absolutely no political agenda! Our mission is to support and promote each other and bring unity and strength to our local metal and punk scene, wherever we plant our flag. We are the bands, the fans, the venue owners and band promoters and bookers, only we do it globally and organized. Other than that, we're just a worldwide punk & metal family. Loyalty, Honor, Pride & Brotherhood! 1. No racism or bigotry of any kind, be it RACIAL, RELIGIOUS, CULTURAL OR SEXUAL. 2. No gang mentality or bullying. 3. No illegal/criminal activities whatsoever! 5. Inactivity and indifference towards the club will result in your dismissal and depatching without warning. 6. No wearing of club patches while riding a motorcycle. 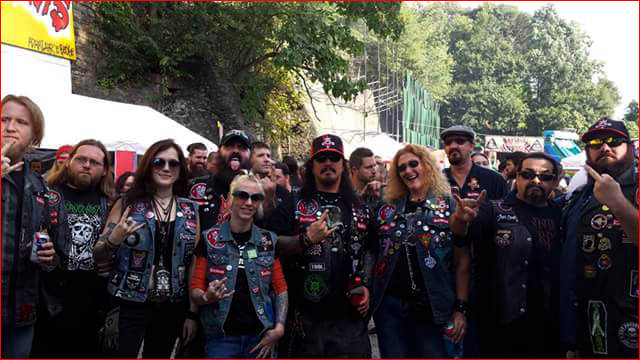 We don't misrepresent ourselves as a motorcycle club nor want to be one! 7. Abide by the club by-laws at all times! VIOLATIONS OF ANY OF THESE RULES WILL RESULT IN THE STRIPPING OF YOUR CLUB PATCHES! IF IT'S NOT IN YOUR HEART, DON'T PUT IT ON YOUR BACK!